Amazon.com is an international e-commerce company offering online retail, computing services, consumer electronics, digital content as well as other local services such as daily deals and groceries. According to recent industry figures, Amazon is the leading e-retailer in the United States with close to 232 billion U.S. dollars in 2018 net sales. 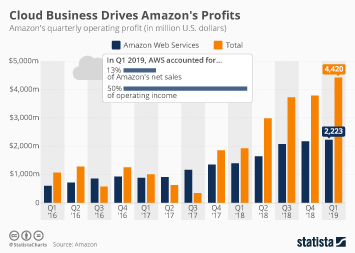 The majority of the company’s revenues are generated through e-retail sales of electronics and other products, followed by third-party seller revenues, subscription services and AWS activities. Due to Amazon’s global scope and reach, it is also considered one of the most valuable brands worldwide. The online retailer does not only lead in terms of desktop retailing but has also taken to mobile commerce. Amazon Mobile is one of the most popular retail apps in the United States. The Amazon smartphone app is also the second-most popular purchase channel of Amazon buyers in the United States. Amazon also offers Amazon Prime, an annually paid membership offering free two-day shipping in the United States as well as discounted one-day shipping rates, which current users regard as one of the key reasons for subscribing to the service. Amazon Prime has since opened to other countries and has also expanded to offer instant streaming of selected movies and television shows through Amazon Instant Video and music. According to a survey of Prime households, Amazon Prime Video was the most popular value-added digital service, followed by music and e-book rentals. The average annual Amazon shopping expenditure of Amazon Prime members was found to be 1,400 U.S. dollars on the online shopping platform every year, compared to 600 U.S. dollars spending of non-Prime members. The most popular product categories of Amazon Prime shoppers in the United States were electronics and physical books, followed by e-books and personal care products. The company also offers its own line of personal electronics, most importantly the Kindle electronics range. Originally offered as a basic e-reader, the Kindle has strongly influenced e-book sales. As of end-2014, Amazon has also made headway into smart electronics with its smart speaker called Amazon Echo, which in turn connects to the voice-controlled personal assistant service Alexa. User satisfaction with Alexa was generally high and Alexa's catalogue of skills has grown from just 130 upon its release in 2016 to over 80,000 skills as of December 2018. Amazon Echo and the smaller Echo Dot device were the smart speaker market leaders in the United States with an install base share of 21 and 21 percent respectively.